This bill was a precursor to the American Bill of Rights, and set out strict limits on the Royal Family's legal prerogatives such as a prohibition against arbitrary suspension of Parliament's laws. More importantly, it limited the right to raise money through taxation to Parliament. The English elite had just succeeded in ousting the Catholic King James, who had offended the protestant Church of England by aggressively promoting the Roman Catholic religion, in spite of laws that Parliament had passed. William III (of Orange, pictured below) and his wife Mary were crowned King and Queen of England (Mary was actually the daughter of the deposed King James II) in Westminster Abbey on April 11, 1689. As part of their oaths, the new King William III and Queen Mary were required to swear that they would obey the laws of Parliament, a significant move from the rule of man to rule of law. At this time, the Bill of Rights was read to both William and Mary. "We thankfully accept what you have offered us," William replied, agreeing to be subject to law and to be guided in his actions by the decisions of Parliament. The Bill was formally passed through Parliament after the coronation. On December 16, 1689, the King and Queen gave it Royal Assent which represented the end of the concept of divine right of kings (see an image of the 1689 statute in the Law Gallery). The Bill of Rights was designed to control the power of kings and queens and to make them subject to laws passed by Parliament. This concession by the royal family has been called the "bloodless revolution" or the "glorious revolution." It was certainly an era for a more tolerant royal prerogative. 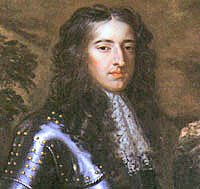 William, for example, did not seek to oppress the supporters of the deposed and Catholic King James II, even as James tried as best he could to rally the Catholic forces within England, Scotland and Ireland against King William III. The Bill of Rights was one of three very important laws made at this time. The other two were the 1689 Toleration Act (which promoted religious toleration) and the 1694 Triennial Act, which prevented the King from dissolving Parliament at his will and held that general elections had to be held every three years. Whereas the late King James II, by the assistance of divers evil counselors, judges, and ministers employed by him, did endeavour to subvert and extirpate the protestant religion, and the laws and liberties of this kingdom. By assuming and exercising a power of dispensing with and suspending of laws, and the execution of laws, without consent of parliament. By committing and prosecuting divers worthy prelates, for humbly petitioning to be excused concurring to the said assumed power. By issuing and causing to be executed a commission under the great seal for erecting a court called, The Court of Commissioners for ecclesiastical causes. By levying money for and to the use of the Crown, by pretence of prerogative, for other time, and in other manner, than the same was granted by parliament. By raising and keeping a standing army within this kingdom in time of peace, without consent of Parliament, and quartering soldiers contrary to law. By causing several good subjects, being protestants, to be disarmed, at the same time when papists were both armed and employed, contrary to law. By violating the freedom of election of members to serve in Parliament. By prosecutions in the Court of King's Bench, for matters and causes cognizable only in Parliament; and by divers other arbitrary and illegal courses. And whereas of late years, partial, corrupt, and unqualified persons have been returned and served on juries in trials and particularly divers jurors in trials for high treason, which were not freeholders. And excessive bail hath been required of persons committed in criminal cases, to elude the benefit of the laws made for the liberty of the subject. And excessive fines have been imposed; and illegal and cruel punishments inflicted. And several grants and promises made of fines and forfeitures, before any conviction or judgment against the persons, upon whom the same were to be levied. All of which are utterly and directly contrary to the known laws and statutes, and freedom of this realm. And whereas the said late King James II having abdicated the government, and the throne being thereby vacant, his highness the Prince of Orange (whom it hath pleased Almighty God to make the glorious instrument of delivering this kingdom from popery and arbitrary power) did (by the advice of the lords spiritual and temporal, and divers principal persons of the Commons) cause letters to be written to the lords spiritual and temporal, being protestants; and other letters to the several counties, cities, universities, boroughs, and cinque-ports, for the choosing of such persons to represent them, as were of right to be sent to Parliament, to meet and sit at Westminster upon the 22 January, 1689 in order to make such an establishment, as that their religion, laws, and liberties might not again be in danger of being subverted; upon which letters, elections have been accordingly made. Having therefore an entire confidence, That his said Highness the Prince of Orange will perfect the deliverance so far advanced by him, and will still preserve them from the violation of their rights, which they have here asserted, and from all other attempts upon their religion, rights, and liberties, the said lords spiritual and temporal, and Commons, assembled at Westminster, do resolve, That William and Mary prince and princess of Orange, be, and be declared, King and Queen of England, France and Ireland, and the dominions thereunto belonging, to hold the crown and royal dignity of the said kingdoms (duhaime.org note: bolded text show in image of original, pictured) and dominions to them the said prince and princess during their lives, and the life of the survivor of them; and that the sole and full exercise of the regal power be only in, and executed by the said prince of Orange, in the names of the said prince and princess, during their joint lives; and after their deceases, the said crown and royal dignity of the said kingdoms and dominions to be to the heirs of the body of the said princess; and for default of such issue to the princess Anne of Denmark and the heirs of her body; and for default of such issue to the heirs of the said prince of Orange. And the lords spiritual and temporal, and commons, do pray the said prince and princess to accept the same accordingly. And that the oaths hereafter mentioned be taken by all persons of whom the oaths of allegiance and supremacy might be required by law, instead of them; and that the said oaths of allegiance and supremacy may be abrogated. "I, A.B. do sincerely promise and swear, That I will be faithful, and bear true allegiance, to their Majesties, King William and Queen Mary: So help me God." "I, A.B. do swear, That I from my heart abhor, detest, and abjure as impious and heretical, that damnable doctrine and position, That princes excommunicated or deprived by the pope, or any authority of the see of Rome, may be deposed or murdered by their subjects, or any other whatsoever. And I do declare, That no foreign prince, person, prelate, state, or potentate hath, or ought to have any jurisdiction, power, superiority, pre-eminence, or authority, ecclesiastical or spiritual, within this realm, So help me God." Upon which their said Majesties did accept the crown and royal dignity of the kingdoms of England, France, and Ireland, and the dominions thereunto belonging, according to the resolution and desire of the said lords and commons contained in the said declaration. And thereupon their Majesties were pleased, that the said lords spiritual and temporal, and commons, being the two houses of parliament, should continue to sit, and with their Majesties royal concurrence make effectual provision for the settlement of the religion, laws and liberties of this kingdom, so that the same for the future might not be in danger again of being subverted; to which the said lords spiritual and temporal, and commons, did agree and proceed to act accordingly. Now in pursuance of the premisses, the said lords spiritual and temporal, and commons, in parliament assembled, for the ratifying, confirming and establishing the said declaration, and the articles, clauses, matters, and things therein contained, by the force of a law made in due form by authority of parliament, do pray that it may be declared and enacted; that all and singular the rights and liberties asserted and claimed in the said declaration are the true, ancient, and indubitable rights and liberties of the people of this kingdom, and so shall be esteemed, allowed, adjudged, deemed, and taken to be, and that all and every the particulars aforesaid shall be firmly and strictly holden and observed, as they are expressed in the said declaration; and all the officers and ministers whatsoever shall serve their Majesties and their successors according to the same in all times to come. Whereas it hath been found by experience, that it is inconsistent with the safety and welfare of this protestant kingdom, to be governed by a popish prince, or by any King or Queen marrying a papist. The said lords spiritual and temporal, and commons, do further pray that it may be enacted, that all and every person and persons that is, are or shall be reconciled to, or shall hold communion with, the see or church of Rome, or shall profess the popish religion, or shall marry a papist, shall be excluded, and be for ever incapable to inherit, possess, or enjoy the crown and government of this realm, and Ireland, and the dominions belonging thereunto, or any part of the same, or to have, use, or exercise any regal power, authority, or jurisdiction within the same. In all and every such case or cases the people of these realms shall be, and are hereby absolved of their allegiance. The said crown and government shall from time to time descend to, and be enjoyed by such person or persons, being protestants, as should have inherited and enjoyed the same, in case the said person or persons so reconciled, holding communion, or professing, or marrying as aforesaid, were naturally dead. Every King and Queen of this realm, who at any time hereafter shall come to and succeed in the imperial crown of this kingdom, shall on the first day of the meeting of the first parliament, next after his or her coming to the crown, sitting his or her throne in the house of peers, in the presence of the lords and commons therein assembled, or at his or her coronation, before such person or persons who shall administer the coronation oath to him or her, at the time of his or her taking the said oath (which shall first happen) make, subscribe, and audibly repeat the declaration mentioned in the statute made in the thirtieth year of the reign of King Charles the Second, intituled, An act for the more effectual preserving the King's person and government, by disabling papists from sitting in either house of parliament. But if it shall happen, that such King or Queen, upon his or her succession to the crown of this realm, shall be under the age of twelve years, then every such King or Queen shall make, subscribe, and audibly repeat the said declaration at his or her coronation, or the first day of the meeting of the first parliament as aforesaid, which shall happen after such King or Queen shall have attained the said age of twelve years. All which their Majesties are contented and pleased shall be declared, enacted, and established by authority of this present parliament, and shall stand, remain, and be the law of this realm for ever; and the same are by their said Majesties, by and with the advice and consent of the lords spiritual and temporal, and commons, in parliament assembled, and by the authority of the same, declared, enacted, and established accordingly. It further declared and enacted by the authority aforesaid, that from and after this present session of parliament, no dispensation by "notwithstanding" of or to any statute, or any part thereof, shall be allowed, but that the same shall be held void and of no effect, except a dispensation be allowed of in such a statute, and except in such cases as shall be specially provided for by one or more bill or bills to be passed during this present session of parliament. Provided that no charter, or grant, or pardon, granted before the three and twentieth day of October  shall be any ways impeached or invalidated by this act, but that the same shall be and remain of the same force and effect in law, and no other than as if this act had never been made.